As the story is told, an ancient Seventeenth Century Dutch sailing ship is occasionally seen by ship’s crews as their vessels battle the elements to clear the Cape of Good Hope at the southern tip of Africa. This ghost story has its origins in both Dutch and German legend. The most common is a tale about a Captain Hendrick Vanderdecken, who set sail in 1680 from Amsterdam to Batavia, in Dutch East India, and his ship disappeared in a gale while rounding the cape. The name Vanderdecken means "on deck" in Dutch. There is a second version of the story. This one tells of a Captain Bernard Fokke who was known for the uncanny speed of his trips from Holland to Java. It was said he was in league with the devil. In all of the stories, the ship remains unnamed. The reference to the "Flying Dutchman" appears to describe the cursed captain and not the ship. According to most versions, the captain refuses to retreat in the face of the storm. In yet other stories, some terrible crime occurs on the ship, or the crew is struck by the plague and is not allowed to enter any port. For whatever reason, the ship and its crew are doomed to sail forever. Literary buffs easily recognize this as a very old legend that dates back to the earliest of writings. Homer wrote of the traveler Ulysses who yearned for home. German mythology includes stories of heroic figures that crossed the waters and later were buried on land with their ships, or their bodies sent out to sea aboard their ships to drift forever. One German legend tells of Herr von Falkenberg, a captain condemned to remain on the waves aboard a crew-less vessel and playing at dice with the Devil for his soul. Thus the Flying Dutchman is a retold old myth, rekindled by the Dutch during an era when they were masters of the sea. The story typifies their personal battles against the sea, and centers at a place most feared by the sailors of old, a point at the southern tip of Africa where it was almost always stormy and many a sailing ship was lost. While there is general agreement that the Lost Dutchman is merely a legend, there have been actual reported sightings of a Seventeenth Century sailing ship battling the elements at the Cape of Good Hope over the years. 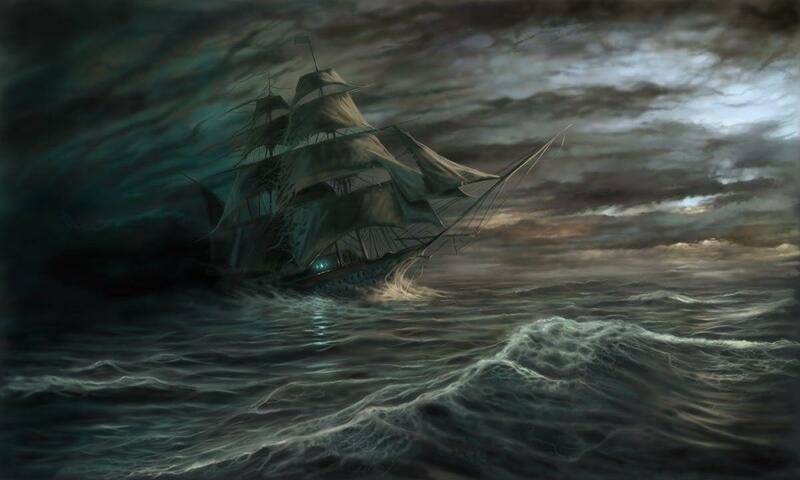 Perhaps the first officially reported sighting occurred in 1835 when a crew of a British ship was rounding the cape and observed a "phantom ship" approaching in the shroud of a severe storm. The British crew said the vessel appeared to be on a collision course, but then it suddenly vanished. A more recent sighting was made by people on the shore in March, 1939. What was astounding was that it was seen by dozens of people who all gave a detailed description of a Dutch merchantman from the Seventeenth Century.